How Tough is a Hoffer Flowmeter? 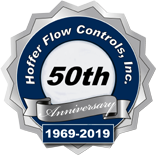 Hoffer Flow Controls is proud to announce the successful conclusion to extensive Shock and Vibration Testing conducted on our HO2 & 4-inch Flowmeters and our HIT- 2A Totalizers. Hoffer Flow Controls is the only Military Shock and Vibe qualified provider of Turbine Flowmeters in the world.Northrup Grumman Newport News Shipbuilding performed the tests in accordance with MIL-S-901D “Shock Tests, H.I. (High Impact) Shipboard Machinery Equipment” and MIL-STD-167-1, Mechanical Vibrations of Shipboard Equipment.What is “Shock Tested?” HO Flowmeters and Hit-2A Totalizers, while operating under 160 psig, were subjected to tests designed to simulate an explosion in the water as close as 20 feet from the “hull” of a ship. The equipment was “hard mounted” to a frame and a 400-pound hammer was dropped nine times to impact with that frame. The Shock Test was then repeated for each side of the equipment. 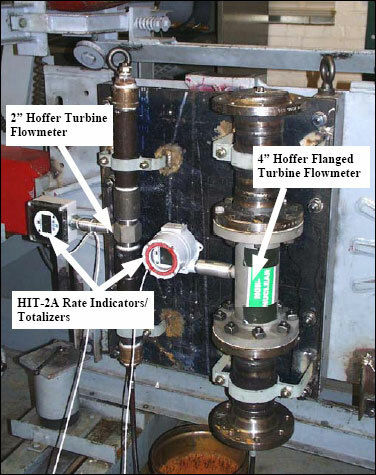 What is “Vibration Tested?” HO Flowmeters and Hit-2A Totalizers, while operating under 160 psig, were subjected to tests designed to simulate mechanical vibrations originating from those of 1) environment 2) those arising form internal excitation, or 3) those associated with reciprocating machinery and propulsion systems / shafting. Once again the Flowmeters and Hit-2A’s were hard mounted on a frame and mechanically shaken. The tests were conducted with variable frequencies from 4 to 33 Hz. That’s 2000 cycles per min. with duration of over 6 hours! How Tough is a Hoffer Flowmeter? Tough enough for the United States Military! Hofferflow supplies Flow meters, flow meter products to the U.S. Government.